Wool@J13 is set on a 600-acre farm in Penkridge, Staffordshire – just 1 mile from J13 of the M6, so access is easy if exhibitors are travelling to the show from any distance and it is also easy for visitors. “It’s fantastic to see so many of our 2018 traders returning for the third Wool @ J13 show – we’re actually now full for Indie Dyers but there is plenty of opportunity for all other types of wool exhibitors to get involved – we’re especially keen to encourage those with a felting businesses to come along. The event is also a great platform for new businesses to launch their show careers – start-ups that are based within a 50-mile radius of the venue can qualify for a half-price stand in the show’s ‘Saw Them Here First’ zone. 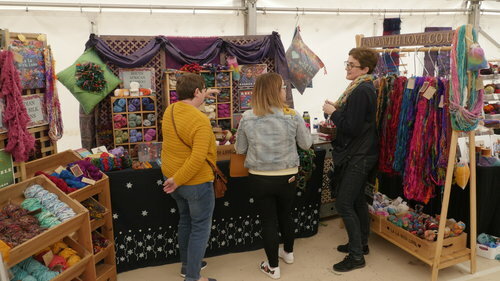 Applications are invited ahead of the deadline of the end of 11th January 2019 to read more about what we offer exhibitors and complete an exhibitor form Alternatively, get in touch with the festival team by emailing hello@wool-j13.uk or calling 01785 330757 or 07717 036213.